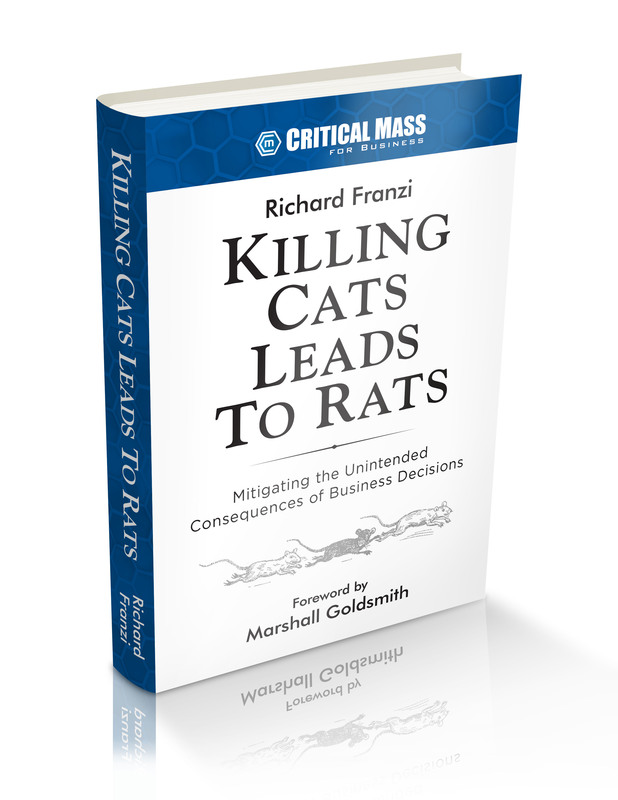 Unintended consequences™ of strategic business decisions was originally researched by Richard Franzi in 2010 when he discovered how commonly they occur. This came to Richard’s attention via his radio show Critical Mass. He regularly heard stories told by his guests, who were CEOs, about the actual outcomes that arose from their strategic decisions. These actual outcomes were all too often counter to the intended outcomes and frequently caused significant negative effects on the business, its performance or reputation. Unintended consequences of strategic business decisions has not be researched nor study in any significant way until Richard decided to undertake this effort. Together with a small team of students from a local university, Richard set out to understand the types of unintended consequences, the causes, and determine the best practices CEOs could employ to avoid, reduce or mitigate the negative effects of unintended consequences of strategic business decisions. Over the years since 2010, Richard’s interest and research into the topic has led him the landmark research conducted by noted American sociologist Dr. Robert K. Merton. Dr. Merton studied large scale social systems and the dysfunction that is all to common within their decision making. When Richard discovered Dr. Merton’s research and in particular his 1936 essay The Unanticipated Consequences of Purposive Human Action he realized that Dr. Merton’s work could be modified to be applied to better understand unintended/unanticipated consequences of business decisions. This breakthrough led Richard and his team to look deeper in the best practices that could be used to mitigate the negative effects of unintended consequences in business. Building on Dr. Merton’s research, Richard has identified a straightforward 6-step process that has been shown to help CEOs to avoid, reduce or at the very least mitigate the negative effects of unintended consequences. The SECURE™ Model was field-tested with leadership teams who were looking for a better way to control the outcomes of their strategic decisions. By employing the model firms have been able to better predict their firm’s future performance and minimize the disruption caused by negative unintended consequences. Over time, the ability to positive predict and control their firm’s performance has led to an increase in the engagement of the employees as their confidence in their leadership’s competency increases. Richard has become a nationally recognized expert on the subject of unintended consequences of strategic business. He covers the topic regularly on his radio show, writes about on his media outlets such as Forbes.com, has led workshops and delivered keynotes to audiences sharing his SECURE™ Model. Unintended consequences™ We provide proprietary business consultation and management services for executive leadership development. Using key indicators, we can help identify and strengthen a leader’s ability to make more strategic decisions and informed business decisions. Whether unintended consequences are negative, positive or have an unknown future impact, they can lead to unexpected outcomes that can have a huge impact on companies. In his book, Franzi highlights examples of unintended consequences by well-known companies including Volkswagen, Pepsi, Wells Fargo, Target, Starbucks and Samsung. He also reveals the five causes that lead to unintended consequences, along with six strategies to help mitigate potentially damaging results. Readers will gain insights that they can apply to their own businesses to help them evaluate potential unintended consequences in advance of decision making and also to find ways to mitigate undesirable outcomes before they get out of control. 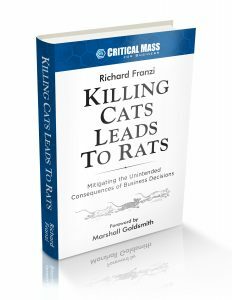 Much like Spencer Johnson’s “Who Moved My Cheese?” and Kenneth Blanchard’s “The One Minute Manager,” Franzi’s book delivers strategic insights that help business leaders think differently for greater success. Richard’s third (3rd) book, published by Motivational Press contains ground-breaking tools to help CEOs to avoid, reduce, and mitigate unintended consequences from damaging a company’s performance and reputation. More importantly, the SECURE™ can help leaders to better control their desired outcomes of their strategic business decisions. Employees expect their leaders to be clairvoyant about the results of actions, taken by the employees, to achieve the stated outcome. When unintended consequences intervene and disrupt the future, the employees begin to doubt their leaders. This doubt can lead to lower employee morale and engagement. © Copyright 2019 Critical Mass for Business. All Rights Reserved. Please enter your information below to have access to our whitepapers. Once the page reloads scroll down to find the whitepapers. You will also be included in our weekly radio show newsletter allowing you to be informed our guest interviews.